If I had to think about my biggest influences to train in martial arts, I’d think about video games—fighting games, specifically. In my neighborhood there was an arcade where kids from all ages would come together to spend all their coins on the latest games. The one station that was never empty, the one you had to wait in line for, the one whose fights were both players’ and spectators’ entertainment for hours, was Street Fighter. Street Fighter II, the game that consumed my childhood budget, was an instant hit because it presented a variety of characters with diverse powers, speed, combat techniques and story lines. This was unheard of then. 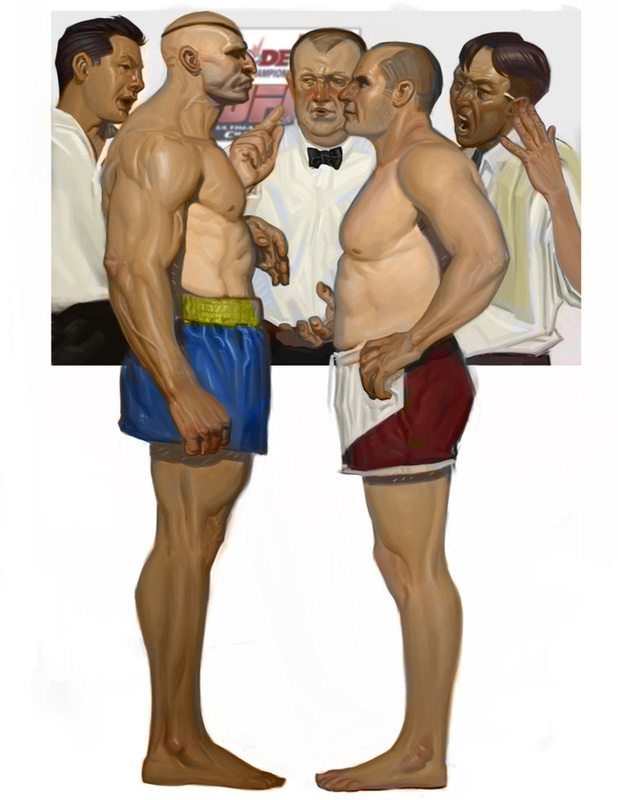 Who would have thought that two years later, in 1993, the dream of facing the best fighters in the world would begin to unfold in real life through the Ultimate Fighting Championship, which invited any man to test his physical abilities in fights without restrictions—in every sense, including wardrobe, time, weight, size, age, and style. It’s not that insane, then, to compare certain fighters with some of the fictional characters in Street Fighter. Take the karateka Ryu, for example: a serious and quiet character, expert in the made-up martial art ansatsuken, and pit him against Lyoto Machida, son of a dynasty of karatekas, and who invented his own style (Machida Karate) to implement into his MMA career. 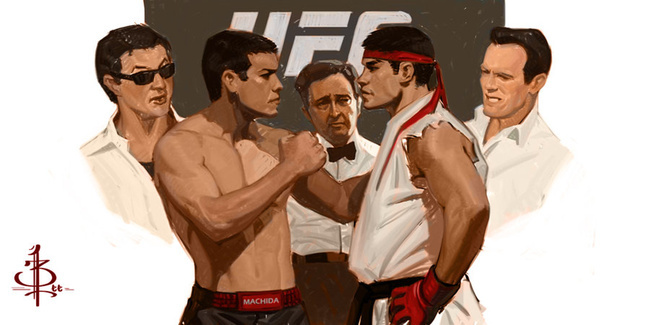 Let’s take it even further—imagine of a match-up between one Capcom’s super fighters and an MMA legend. It’s a dreamy vision for martial arts fans and Capcom fans alike. Bryan Lee is a creative artist who masterfully forges a series—which he created just for fun—a reality in which our favorite fighters are inserted into a fantasy world, where we also might find some childhood heroes trying to exist in a normal world. “My work’s objective is to make people laugh. I like to draw and paint things that make you smile,” Lee explains. 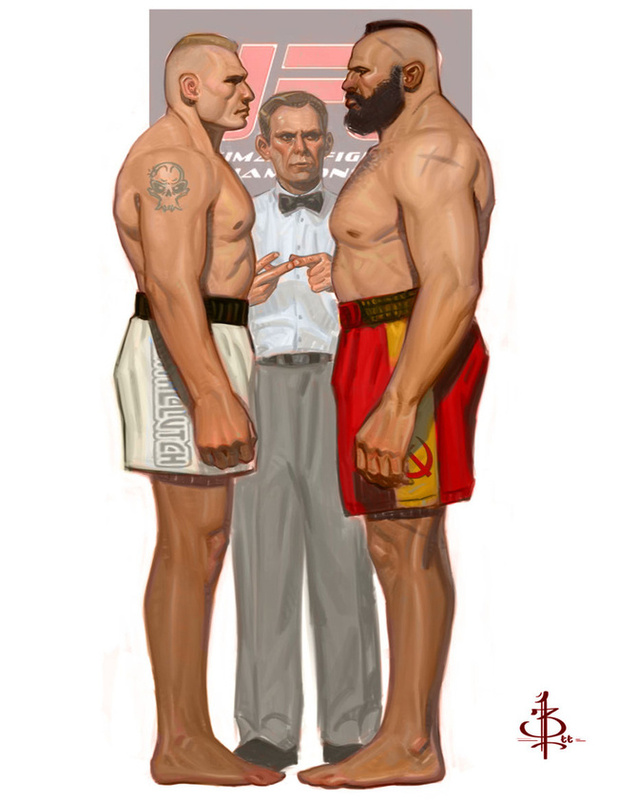 “The fight I’d like to see is between Brock Lesnar and Zangief. It’d be awesome to see these two giants in the Octagon. I don’t know who’d have the upper hand, but I know there’d be massive damage in the scene. We’d have Brock’s F5 maneuver—which characterized him in the WWE and looks truly painful—against Zangief’s 360 blender move,” he continues, expanding on the inspiration behind his illustrations. 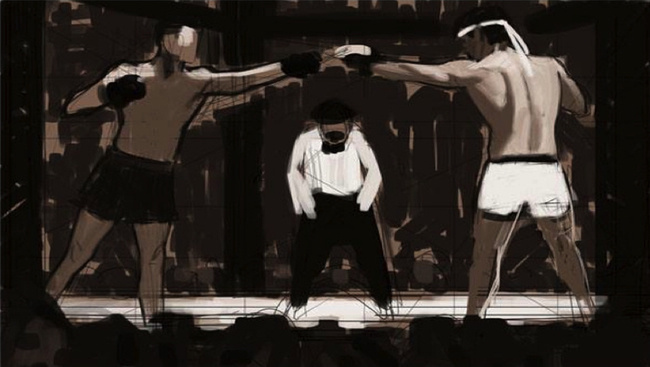 “How would you fight unarmed against someone who can throw balls of fire,” he asks, commenting on this image of Sagat facing off with Fedor “The Last Emperor” Emelianenko. Bryan Lee is a professor at Otis College of Arts and Design in Los Angeles, a collaborator at Mayfair Comics, and an accomplished athlete. He’s run marathons, trained in weightlifting, taekwondo, kickboxing, MMA and breakdancing—a discipline he’s passionate about and continues practicing. He says that training with different types of people, as well as in different disciplines, has helped him as an artist because it gives him the opportunity to study and understand different types of bodies, as well as providing great fun and keeping his creativity sharp. Bryan’s work—full of humor and some irony—has been influences by artists such as Normal Rockwell, Dean Cornwell, J.C. Leyendecker and Nicolai Fechin, which is why we shouldn't be surprise that his aesthetic reminds us of another epoch. 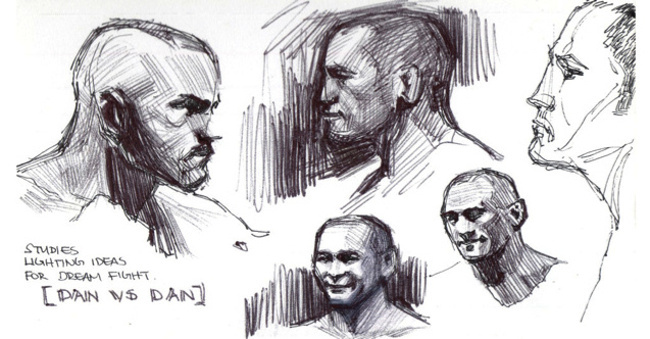 Like every artist, martial and otherwise, Bryan’s ability comes from illustrating daily. He tells me that he makes one portrait every day on top of commissioned work and independent projects. It blows my mind to see hundreds of portraits—of famous people and common people alike—each one as good and expressive as the previous. Bryan considers the discipline of art a rigorous training. He says that, with time, he begins to notice details where he could’ve done a better job. I agree with him—I wish those encounters could happen, so I take the chance to ask him a question that I hope will end up influencing his creative unconscious to do more pieces like these. I want to see more fighters from my childhood take on my favorite characters, so I give him a list to illustrate some more fantasy matchups. “I’d put Kazushi Sakuraba against Blanka because he’s from Brazil, and he fought almost all of the Brazilians at Pride. It would be awesome to see Cain Velasquez go against Hugo, a really big guy. 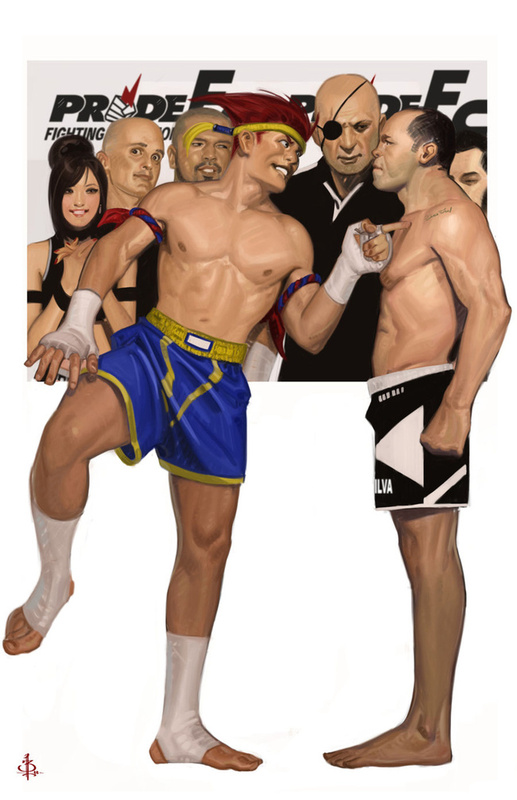 I’d put Chuck Lidell against a boxer, like Balrog or Dudley. I’d make Mark Kerr (Bryan’s favorite) against Alex, from Street Fighter III. Camy would have to go against Michelle Waterson, or even better—Ronda (laughs). 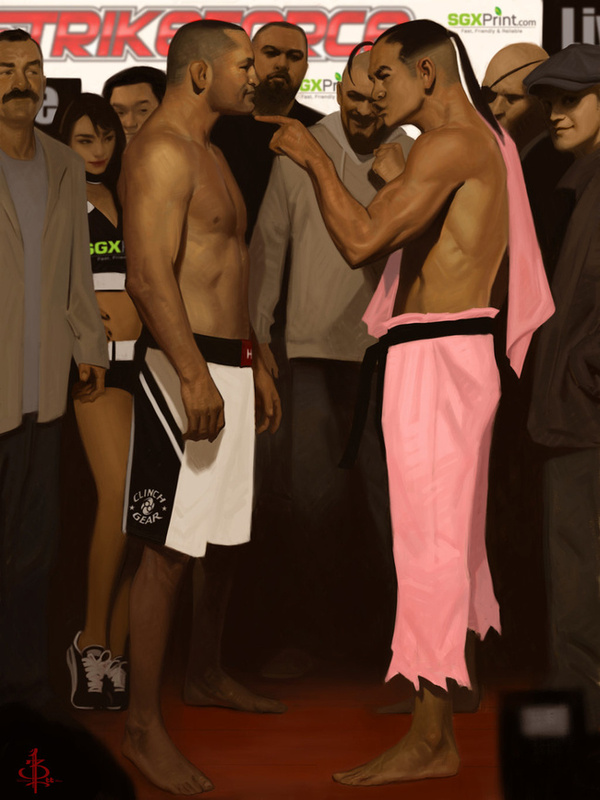 It would be like the Lyoto-Ryu piece—maybe it will be my next piece. See more of Bryan's work on his website.